^ William Turner (1913). 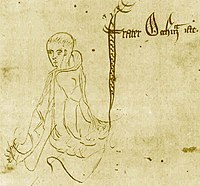 "William of Ockham" . In Herbermann, Charles. Catholic Encyclopedia (in English). New York: Robert Appleton Company. ^ W. M. Thorburn (1918). “The Myth of Occam's Razor”. Mind 27 (107): 345–353. doi:10.1093/mind/XXVII.3.345. http://en.wikisource.org/wiki/The_Myth_of_Occam%27s_Razor 2006年10月25日閲覧。.